This one is for all of you shopaholics or deal-hunting window shoppers! If you have been following our posts this summer we hope you have found some inspiration and are itching to start a new project. Many of the retailers we have mentioned in our blogs can be found online, but what about local ones? We’ve decided to highlight three design districts in Vancouver that we love. Whether it’s shopping for ourselves or our clients these are sure to be on our hit list. Nothing to do this weekend? 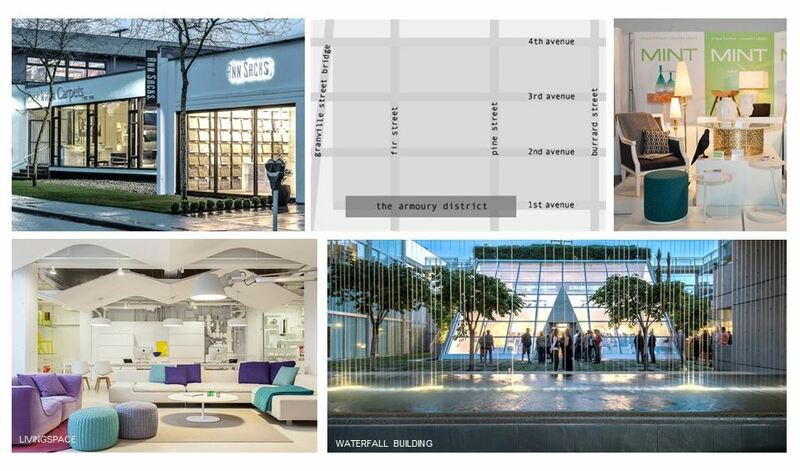 Why not spend a few hours in one of these great design districts and seeing all the great finds right here in our very own backyard? A hidden gem that few Vancouverites know about is The Armoury District. Located just west of Granville Island between Granville and Burrard, north of Fourth Ave, this is Vancouver’s up-and-coming design and lifestyle district. It is home to many Interior Designers, architects, furniture and tile showrooms, art galleries and fine food purveyors. Before taking a stroll around the area, grab a delicious latte from Café Bica. Some of the stores you must check out are Livingspace, Metropolitain Home and Mint Interiors. Renovating your kitchen backsplash and looking for that one-of-a-kind tile? Then head over to Ames, Stone Tile (a personal favorite) or the beautiful newly opened Ann Sacks showroom. While you are in the area make sure you stop by and appreciate the stunning Waterfall Building on West 2nd Ave. designed by the late Arthur Erickson, one of Canada’s most influential Architects. You have probably driven past this district many times on your way downtown. If you haven’t stopped to check it out, you definitely should! It is home to many of the greats. You can easily spend a whole day going in and out of all the shops. We certainly can! 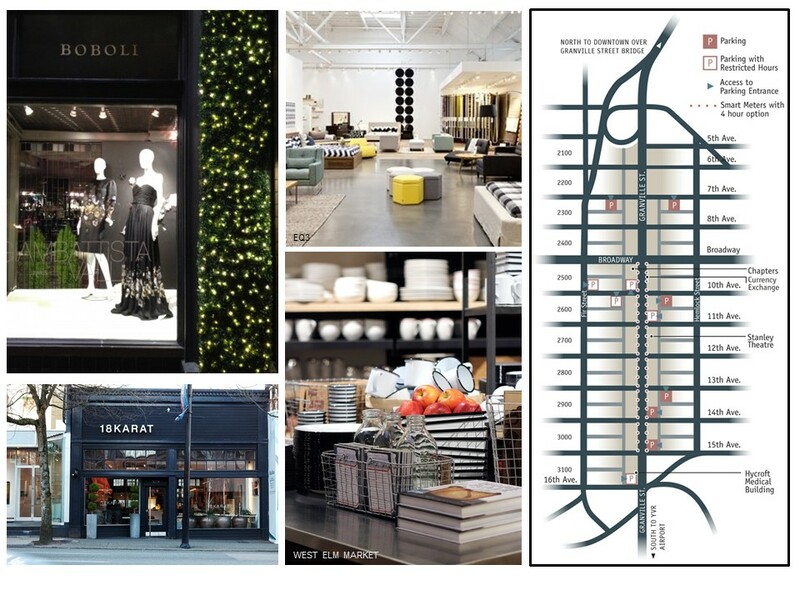 Here you will find 18Karat (love this store every season the merchandise changes), EQ3, Pottery Barn, Restoration Hardware, Urban Barn, West Elm and Williams Sonoma among many other home décor and furniture retailers. These retailers have online stores, but actually seeing a piece in person can be very different! You will also find many high-end fashion retailers (like Boboli) only found in this neighborhood. It’s a great way to spend a weekend afternoon. I mean who doesn’t love lunch, fashion and home shopping all in a few hours? Once you find parking (trust us, you will want to take a vehicle), start at either Broadway or West 15th and work your way around! 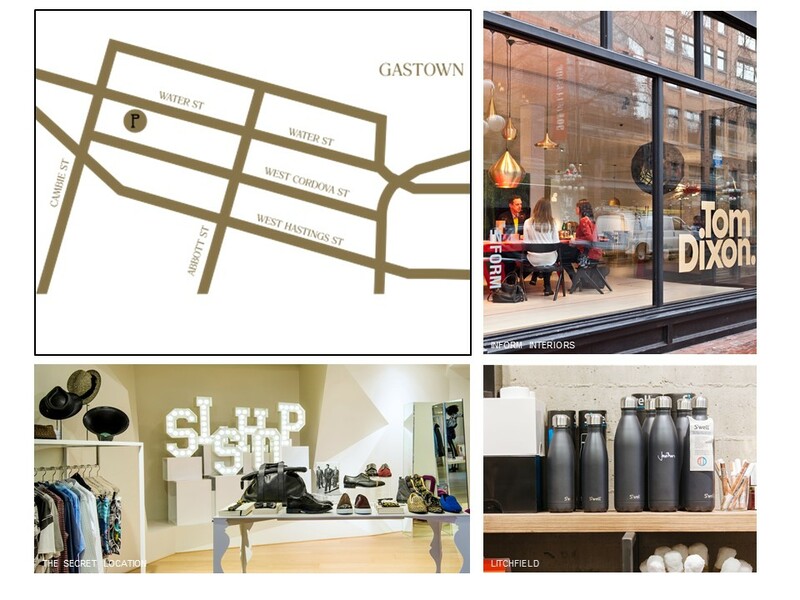 Everyone knows Gastown attracts numerous people as a tourist destination, but it also home to a few great design stores as well. Next time you’re meeting a friend, why not do a pub coffee crawl as there so many great new venues. For example we love the interior design of Timbertrain Coffee Roasters. Once you have your caffeine fix, you should be ready to pound the pavement. First stop, Inform Interiors for contemporary furniture, lighting and accessories. And the books… did we mention the magazine selection too? One of the best sections in the store! If you want to find something with an European influence, check out espace d. for some unique home décor. Looking for the design savy guy on your list? Litchfield is a must. They carry some of the best tech accessories and toiletries for men. Old Faithful has that utilitarian meets vintage vibe. Here you will find an array of cutting boards, cleaning supplies, ceramics and wire baskets. If you’re looking for inspiration, Secret Location is a concept boutique worth taking a peek at which houses fashion, food and décor all under one roof. Small space living is not a new idea, nor is it uncommon. With the cost of housing in Metro Vancouver perpetually rising, many of us have no choice but to downsize or start off in a super small place in order to live anywhere close to Vancouver. Yes, those laneway homes look adorable and the micro studios downtown are almost like the ones in New York (almost, being the key word), but how do you keep 500 square feet of space or less comfortable, functional and stylish? We have solutions! Follow these 10 expert tricks and you are sure to have small space that you will love coming home to. Declutter — Your home is already small, why make it feel smaller? Go through all your stuff, pair it down and keep it under control. You really don’t have room to keep things that you don’t use on a regular basis. Rule of thumb, if you haven’t looked at something or used it in the last six months – chances are you won’t miss it, so purge! Stay Organized — There really is no option but to stay organized in a small space (otherwise you are sure to lose your mind, I know I would). Having a home for everything from your house keys, iPhone, books, seasonal clothing, etc. will have you stay calm cool and collected. Ever heard that saying a messy house is like a messy mind? A great local store is Room in Order. They can help with everything from food storage, entry organizers to cool gadgets like the Sanctuary4 which houses all your Bluetooth devices and looks great doing it! Simplicity — visually, we need space to feel at ease. No one really enjoys that claustrophobic feeling you get in a closet! There’s nothing wrong with having bold patterns or colors, but a lot in a small space can be overwhelming. Keep it minimal and use your favourite colors as accent pieces for a little punch. Maintaining a more neutral space will help create the illusion of a larger more cohesive space. For fun check out the line Hay available at Vancouver Special which makes some fun and colorful towels that could brighten any bathroom. Built-ins — If you plan on staying in your small space for a long time, it is worth investing in built-ins. This helps in utilizing every inch of space you have by creating furniture and storage that best suits your needs and lifestyle. Have you seen the videos of small spaces that transform to perform different functions? That’s what we’re talking about. Here’s one from Gizmodo that you should check out for inspiration. Resource Furniture specializes in small space and multi-functional furniture for condos and micro units. Utilize Vertical Space — a continuation of tip no.4; why not take the millwork or built-ins to the ceiling. I realize it’s not practical and hard to reach – but how often are you digging out that Halloween costume or Christmas decorations. It is extra space you would not have otherwise and is great for seasonal items. Keep it Light — Bright and airy spaces always feel bigger, that’s a fact. 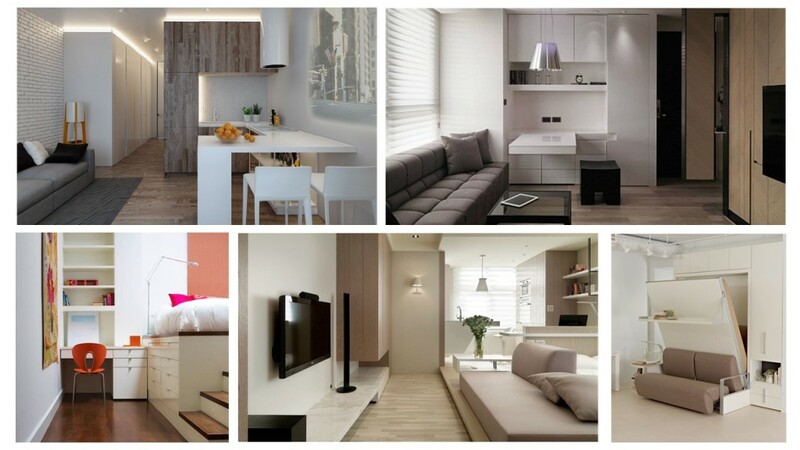 We love white (as mentioned in an earlier post (“Why I love White”)… but we especially love it in small spaces! It reflects light really well and you have the opportunity to play with textures and finishes without worrying about too much visual business. If white is still too clinical for you, mix in a lighter stained wood with a simple grain pattern such as oak. Reflect – Mirrors are a clever visual trick that always works. Often you will see it used in a long and narrow space to give the appearance of width that doesn’t actually exist. You can also use this principle in your tight corridors or nooks. Place a large one near your entry or behind some open built-in shelving to create the illusion of a bigger space. EQ3 offers some slim profile versions that aren’t too bulky. Double Duty Furniture — Banquette seating with storage underneath and open shelving that doubles as a room divider are examples of double duty furniture. These pieces can be custom made or even found at IKEA if you are working with a smaller budget. You just have to get creative! There are also some really cool pieces on the market from Europe. One of our favourites from Italy is Clei. They offer unique systems and pieces that are not only functional but are also sleek. From wall beds and sofas to dining tables and desks, you are sure to be mesmerized. Who says your living room couldn’t also be your bedroom? Create Art Out of the Ordinary — Believe it or not, your everyday items can be art. Simple things such as a wall clock or a lamp can be statement pieces. Select these items carefully and combine them with the tips we have in our post “All You Need is Art” and your space will have some added character without the extra clutter of many little pieces of décor. Unobstructed Views — Chances are, your small space won’t have a lot of windows nor will they be expansive. Make the most of them by keeping them unobstructed. If you do have large windows that feature a spectacular view, don’t hide it! Access to natural light and views is important as it expands the space and keeps it from creating that tiny cabin-like feeling. It has been a hot summer and we have been enjoying almost endless amounts of sunshine. As vacations and weekend getaways wrap up in the next few weeks, many students will be getting ready to spend more time inside… at school. Yes, I said it, it’s almost time to get ready to go back to school. Homework and studying is on the horizon, but there is still reason to get excited. 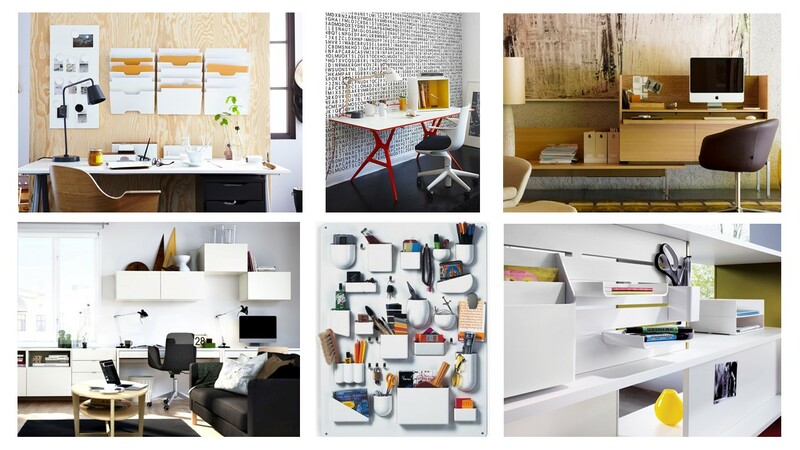 Why not create a study space that is functional, stylish and fun? It can be a quick weekend project that will get the students a little more excited to hit the books again. Before you go out and shop, here are a few things to keep in mind. The bare bone essentials for a study space begins with a good desk, task chair and lighting. If homework isn’t done at the dining table, a desk and task chair is a must. It creates a space where they can have everything they need so they can get their work done. A study space doesn’t have to be a dedicated room either, it can be a corner! A simple desk doesn’t have to be expensive, you can pick one up at IKEA for less than $25. If you want something a bit nicer, we like the industrial looking go-cart rolling desk from CB2. For those who would like the option to work standing up, a desk with adjustable legs is worth considering. Investing in a good task chair is crucial as it can make a huge difference in the long run for your back. The ones we have at our office are the Sayl Chairs from Herman Miller. Beautiful, yet so comfortable because of its ability to be adjusted. When looking for a good task chair, things you should consider is if you need the seat height, seat depth and arm rests to be adjustable? Will your chair be stationary or on castors? Did you know that at time of order, we specify if it will be used on carpet or a hard surface? Don’t forget about a good task lamp. There are so many options available now – you are sure to find one that suits your style and budget. A few of our favorites include the clean and simple Pablo Lim C Table Lamp (is always stunning). The Artemide Demetra table lamp and West Elm Industrial table lamp offer an adjustable option. The IKEA Harte LED work lamp is quite unique and gentle on the wallet. From pens and paper to binders and textbooks, there is no shortage of stuff that end up in a study space. Having some storage is necessary to keep the clutter on your work surface manageable and organized. Depending on the size of your space, you can have a combination of wall shelves, bookcases, drawer units and storage cabinets. Desk accessories such as pen holders as well as boxes and magazine holders are also great to keep smaller items and loose paper organized on your desk. If you find that drawers are always an endless mess, trays and little boxes are super helpful. Take a browse through The Container Store or All Modern for inspiration. Cutlery trays are also a great solution! No more digging around for your favorite pen or a paper clip! To keep track of exams and due dates, a calendar drawn on a magnetic dry erase board is functional and can be easily maintained. For something a little fun, CB2 also has a brick wall corkboard for something more interesting than the usual Staples “special”. One accessory we love, love, love is the Kartell Uten.silo which was originally marketed for the kitchen. We love filling the various size pockets with tape, pens, rulers, envelopes, etc. Who says your study has to be boring? Remember making forts out of blankets and sheets as a kid? It was your favorite escape, a world that you created and where your imagination ran wild. In the same way we need a space to call our own, so do the kids. 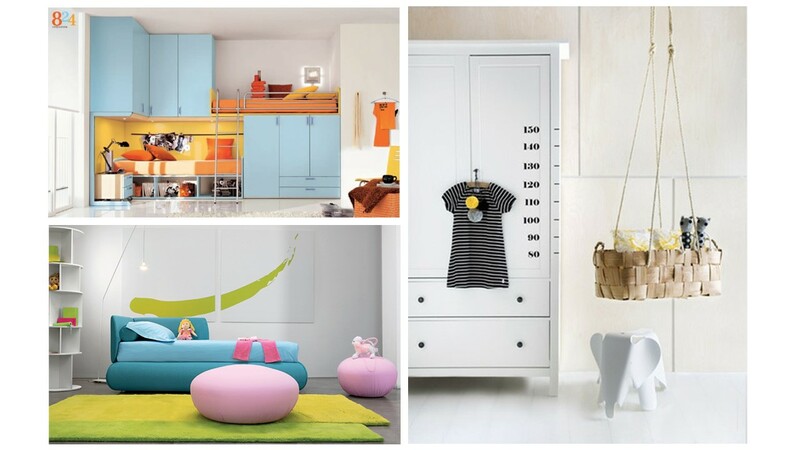 However, not everyone is lucky enough to have a playroom so your child’s bedroom is their haven. Designing a kids’ room doesn’t mean you have to sacrifice style. There is a whole world of design possibilities even for small spaces. It’s the perfect excuse to try something bold, fun and whimsical that your kids are sure to love. Let your imagination run wild! First things first, a kids’ bedroom has many changing functions. If this is the bedroom your child will be growing into, you need it to be able to transform as they get older. Determine the core functions of the room first, you will be glad you did. Will your child need a desk? How about future play dates and sleepovers? If your child loves to read do arts and crafts or have lots of toys, you will need to allow for plenty of shelving and storage. Make sure to mount freestanding storage such as dressers and bookcases to the wall so they don’t fall over if your child likes to climb (I was that child). If your child is still in a crib or toddlers bed, you will need to make sure there is room for a twin or larger bed in the future. Chances are, you will not want to redo their room over and over (nor have the budget to) so give this some good thought! In Canada you might find that furniture shopping for kids and teens is a bit challenging. We don’t have nearly as many options as those in Europe. I often turn to the web for inspiration. How about turning a daybed into a sofa – multi function is great for teen rooms. Have you noticed in nursery and children’s rooms they tend to stay away from cutesy themes like “Walt Disney” (no offence Mickey) and they instead turn to color and graphics. They use color blocking and bold colorful accents and keep patterns to a minimum. As your child grows it’s much easier to re-paint a feature wall then strip the Winnie the Pooh wallpaper. If you really have your heart set on a “theme” room. Why not source a print of Winnie, wall decal or a toss cushion? These are easy to change in a year when the next new fad is all your child is talking about. Trust me you will thank us!